Migration of an existing large Redmine instance, upgrading to the latest version, new development of Redmine plugins. Analysis, consulting, maintenance, extension for a datacenter management application of a very large and well known European ISP. Built an application to allow event planners to navigate through and search for different types of event service providers (e.g. location, restauration, …) based on comprehensive search settings. Prototype development of a vertically scalable video platform. Consulting, training and development. Developed a VOIP application that allows user to submit audio commentary by telephone (PSTN via SIP) for POI / directory site. Automated server setup with Chef. Ubuntu virtualization with KVM. Internationalization, localization, integration with external systems. Customer from publishing industry. Social network focused of connecting employers and employees using profile matching (Holtzbrinck eLab). Extension of the existing direct sales plattform of a leading insurance company. Part of the Yahoo team that built and managed the official FIFA World Cup 2006 websites in various languages. Created a recurring billing system for online games. Extension and maintenance of a car rental web application. Launched Amazon Marketplace in Europe. Localization, customizing for the German version. DigitalOcean is an US cloud hosting company with data centers in New York and Amsterdam. 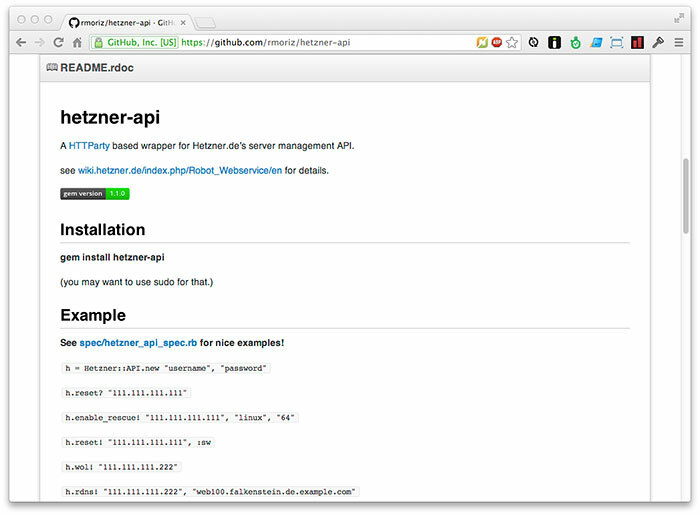 My rubygem provides an easy to use interface to their REST-API to manage virtual servers. Uses travis-ci, codeclimate and coveralls to ensure code quality and test coverage. To integrate DigitalOcean into the Chef DevOps framework, I've created a plugin to chef's cli knife. This allows bootstrap servers with a single command line command. Supports traditional chef-server environments and chef-solo using knife-solo or custom bootstrapping commands. This is one of the very few open source plugins to knife that has some tests at all. 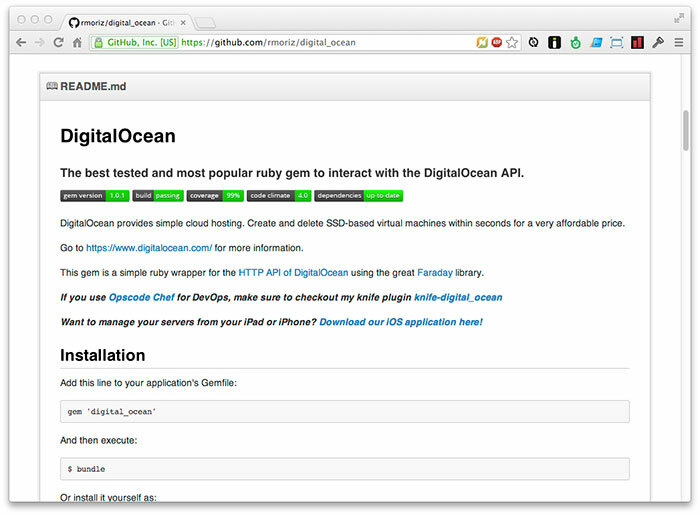 I have published and maintained an open source Rubygem to interact with their API. This allowed me to automate some infrastructure tasks using Ruby. With the rise of more scalable cloud providers like AWS, DigitalOcean or Heroku, this is probably only be interesting for legacy projects. 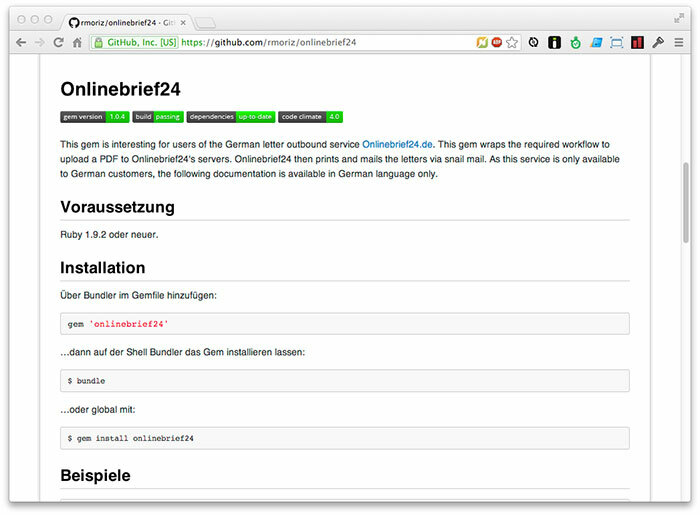 Onlinebrief24.de is a German pdf to snail mail service. My rubygem provides a fast and easy way to deliver those pdfs to their API using SFTP. This allowed me to automate various invoicing workflows within a SaaS application. Also: Travis-CI for continuous integration and Code Climate for code inspection. Because there is no official way (no OpenData) to check the live timetable MVG live of the city-owned public transportation of Munich (MVG) on the command line, I've reverse engineered their GWT-based AJAX data feed and build a small ruby application for the console. An extra option to output JSON instead of human readable text is included. 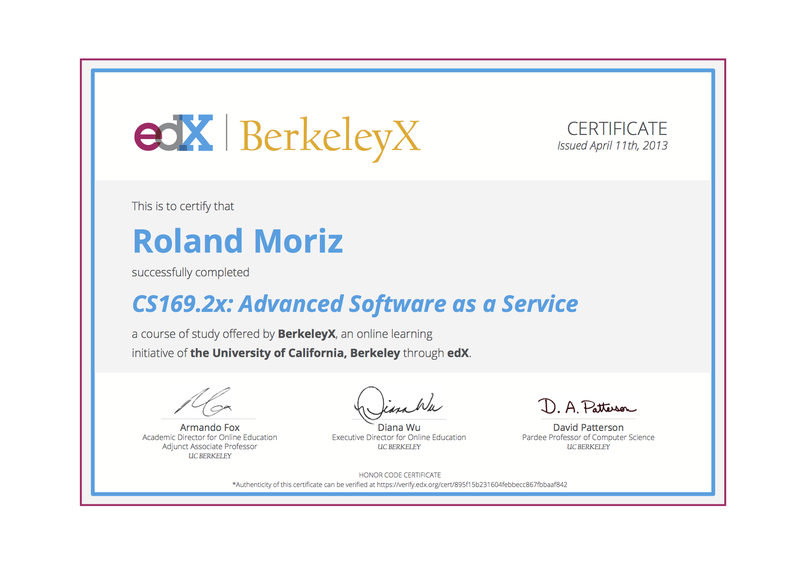 CS169.1x teaches the fundamentals for engineering long-lasting software using highly-productive Agile techniques to develop Software as a Service (SaaS) using Ruby on Rails. 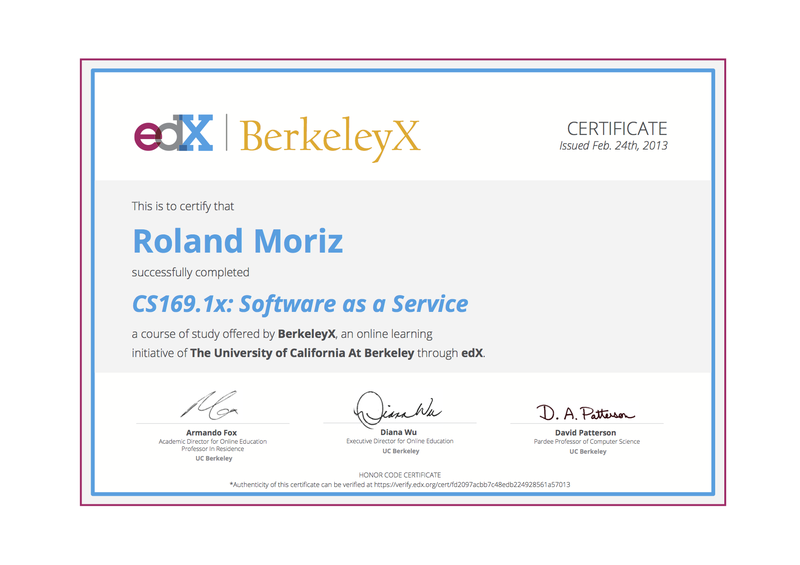 CS 169.2x is the second half of University of California, Berkeley's semester long course on Software as a Service. I am available for projects both directly as a freelancer or as part of Moriz GmbH. I usually bill by the hour. Due to lack of sustainability for both sides and uncontrollable project risks for me I'll reject fixed-price projects, unless a sufficient specification is provided. I am happy to create a specification as part of a consultant project with hourly billing. My fees vary according to the task, location and challenges to be solved. On-site project in Berlin, Munich or Vienna. If you need a third-party recruiter to hire me, this will cost you additional money (~15-30% depending on the recruiter). I can't control this commission.